My #LoveTheBoss female business owner today is Heather Waring. Heather and I go way back, we used to meet up regularly when I lived nearer to her, in Canary Wharf. Welcome, Heather. Do tell my readers something about you by way of introduction. How long have you worked for yourself? And perhaps something surprising we may not know about you? I’m Heather Waring and I’ve had my own business now since 2000. I’m currently walking a 1000 mile path from Le Puy en Velay in France to Santiago de Compostela, I’m just over half way there. I am a coach, a trainer and a speaker and these three strands run through all that I do and stay constant, it’s the niches that have changed for me. I started off as a life coach and quickly realised that most of my clients came to me with a job related issue so for the next 7 years my business was as a Career Development Strategist providing help and support (and strategies) to people in a variety of different situations regarding their career. I had great success here but something was missing and, in late 2007, I realised that my passion for long distance walking was as strong as that for coaching and I started to develop Walker’s Coach where I coached clients as we walked. I also trained those wanting to do long distance treks to get fit and fully prepared and ran local walking groups for women. I had great plans but sometimes these do not work out as you hope and after working really hard at testing out all the different elements over a couple of years, when some were very successful and others not, I had to admit that this was not a business model that was going to work or bring in the income I desired. I was still working with a core of past clients most of whom were business women and owners of SME’s, so I built on that really enjoying the business coaching side of things and also business management which I was providing for a couple of clients who were speakers. I have always invested in my own personal development and over the last 12 months have found my journey taking a few twists and turns as I questioned who I really was and what I really wanted to do. My walking is very important to me and I wanted to find a way to bring it into my business but not as I had with Walker’s Coach. This has been a 12 months of frustration, highs and lows with me feeling I had the clarity one minute and feeling lost in fog the next. It’s probably no surprise to know that I can coach my clients through this but not so easily me! I’ve had to deal with some health issues too and the fact that I do far too much but what is emerging is a new niche, one which can easily include those SME female business owners as well as other women who are 40+ who have got to a point in their lives where life is not exactly what they hoped. They are not fulfilled or satisfied and although life may be good, that life is not a true reflection of themselves. My role is to help them get that clarity out of all the confusion and get them back on their path. So I am going through a re-brand, I’m really excited as I feel I’ve come home and with the path analogy I can bring in my walking and some of my programmes will include walking, likely on a section of my beloved Camino. I am preparing to fly in 2014 and to work with amazing women helping them to be their real selves which I believe many of us women are not due to all that we do in terms of supporting and being there for others. We say ‘yes’ when we should say ‘no’, cancel our gym and pamper sessions because something else seems more important and we don’t give ourselves time to dig deep and answer those questions that would allow us to bloom. I run my business from my garden office and contract out services to other professionals. My daughter will be off to University in 18 months so the lifestyle I am designing now will allow my husband and I to travel more together, to speak and work globally from our laptops and many of my programmes will be online or delivered via Skype, so there are no boundaries at all. I think it has to be belief in the fact that no one else can do what you do in the way that you do it, you are indeed unique. The other thing that comes to mind is the importance of support and that can come from a number of places. It can be from belonging to a networking group where you get support from the group itself but also from some individuals who you will meet and who will become close friends and colleagues. Support from a coach or mentor and from a mastermind group. It’s so important to have others to talk to through both the good and not so good times. I don’t recall struggling with a lot at that stage, I seemed to just get out there and go for it and so many opportunities came along. My struggle was more when the whole idea of leveraging my skills came along. I needed help in knowing what to package and then what to charge for products and services. I think pricing can be very difficult. I worked with mentors, and others who had gone before, to teach me and who had the skills that I, at that time, was not so strong on. I have learnt so much about my abilities, my values and expertise. I’ve learnt about stepping out of my comfort zone and how important it is to do that and to trust that it will be OK and I think one of the most important things is that I cannot do it all myself so I need to call in others and contract out services to them e.g accountant, VA, web designer. So many people still try to do it all themselves but hiring others frees you up to concentrate on what you are good at. My leap into self-employment was as a result of bullying in the workplace and my wish, when the time was right for me, to move away from that job and into something where I could rebuild my self confidence and self-belief. My daughter was 3 years old and I discovered coaching and it really matched my skill set and what I was looking for. It was a great move and I have no regrets at all, in fact I am now able to look at the positivity that came out of the bullying. It also allowed me to be able to be more flexible for my daughter as I could pick her up from nursery and as she has gotten older, I am able there for school events etc. I am in charge of my own destiny. I can design this life how I want it to be and I can make changes in response to how things are developing quickly. Do you have a new project that’s exciting you right now? There are a couple of new things coming on board next year, one is an ebook on Virtual Book Tours and then a ‘done for you’ version of this for those who have don’t have the time or inclination to do it themselves. 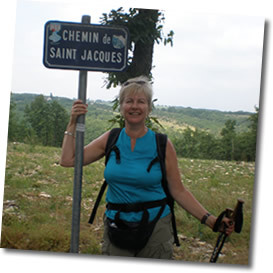 I will also be launching my Camino Experience, a coaching programme that includes 5 days away in France walking part of the Camino de Santiago de Compostela. People can find out a little about both by visiting the events page on my website and they can email me for more information if interested. No I don’t, I actually love working for myself and really enjoy days when I am in the office on my own with time and space to get on with things. That’s the introvert side of me I guess. I’m a bit of a mix of intro and extrovert and on a week by week basis I’m not often on my own as I either see or talk to clients on the phone or on Skype. I am networking, meeting up with colleagues to collaborate or having a coffee with a friend. If you work for yourself and are home based, the answer is to make sure you have support and that you get out and meet others. Thanks so much for taking part, Heather, and good luck with your re-brand in 2014? Meanwhile, how can we find out more about you and become your fans and followers? Please return this with a photo (or permission to pinch one from your existing website/social media profiles). And please share your website/blog URL, Twitter and FB profiles etc.